Nomad has built its brand on a blend of beers that don’t always play things straight. In the main this is done by way of the addition of native Australian ingredients, something perhaps best seen in beers like the Long Trip saison and Freshie salt and pepper gose. Along the way, they’ve had a few attempts at nailing a beer that sits in the approachable zone between pale ale and session IPA while taking in some of the more esoteric elements of their overall vibe, but none has managed to command their place on the permanent roster. Changing focus away from some of the unusual ingredients and the travelling theme which underpins so many aspects of Nomad, they’ve stuck a flag in the ground with this late 2016 release and it might just end up being the beer they’ve been searching for. 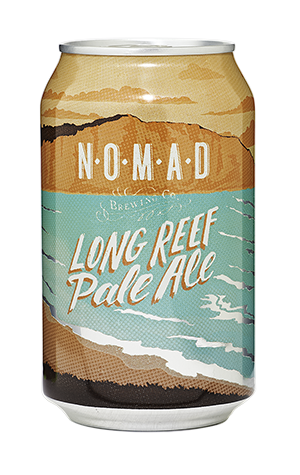 Firstly, the Long Reef Pale Ale is named for the reef up the road from the Brookvale brewery so it literally comes wrapped with a local association. Secondly, it comes in a can which, when you're pitching a beer at a beach-loving crowd, is going to give you some extra runs on the board by virtue of convenience alone. Thirdly, it does the job on the taste front. This Aussie pale ale is not blow-your-socks-off hoppy, though it’s not exactly shy. Late boil additions of Australian hops are an important feature in the beer’s construction which errs towards having strong tropical fruit characters working in tandem with a firm bitterness. It’s not a beer that’s been made to mull over, so for those times when you just want a solid pale ale this’ll deliver exactly what you need.